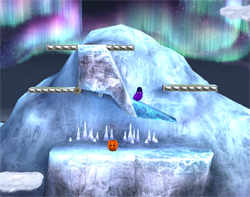 This mornings update to Smash Bros. Dojo is a new Ice Climbers stage, The Summit. At first it appears you are on glacial peak, but then the stage breaks off and drifts into the ocean. Oh and then a fish jumps out at you, a fish that you might have seen somewhere before, but I don’t recognize it. Anyway, pretty interesting looking stage, I guess.